A family fight in the Bronx escalated to a fire; now police are questioning the father over allegations he burned his wife and kids, then tried to trap them in a burning apartment. Lori Bordonaro reports. 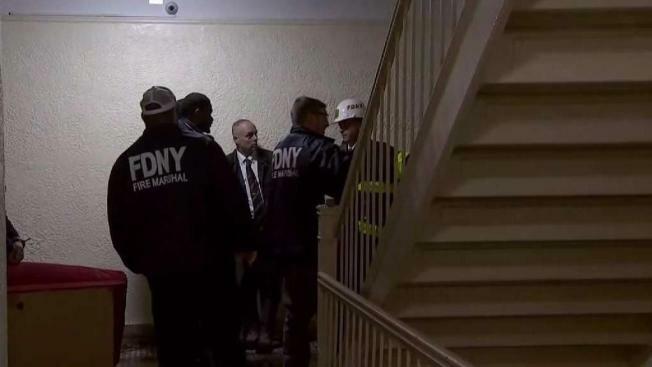 A father is in custody for questioning in connection with a fire that tore through his family's Bronx apartment Friday, leaving both his baby and the child's mother burned, a police source familiar with the case tells News 4. Police and firefighters responding to a 911 call about a two-alarm blaze at a multi-story building in Wakefield around 10:30 a.m. found the man screaming and cursing in the hallways, being held down by neighbors, according to fire officials. The door to the apartment was barricaded with a couch. Firefighters had to go up through the fire escape and through the window to remove the couch, fire officials said. The woman and infant were found badly burned, and were both taken to a hospital in serious but stable condition. The man was taken away in handcuffs, neighbors said. At least three other people were reported to have various injuries, but details on those patients weren't immediately available. Investigators are working to determine the cause of the fire but say it appears suspicious.